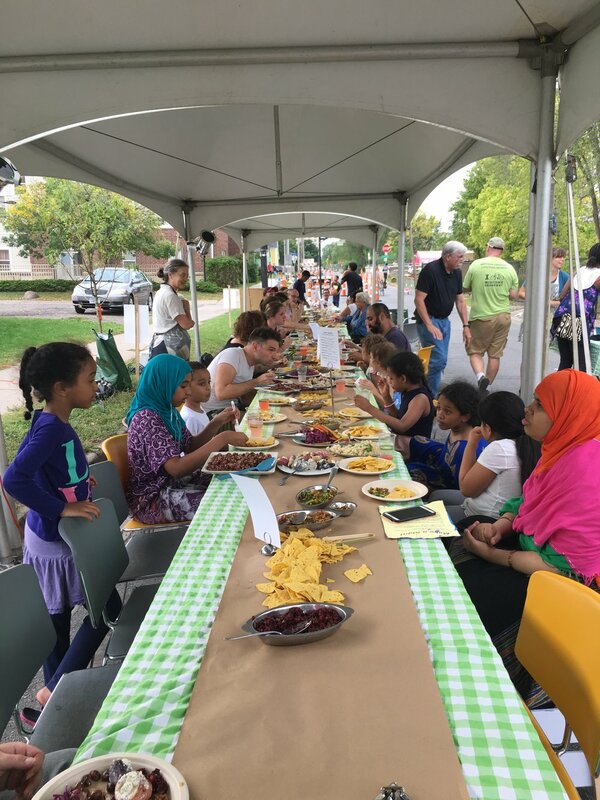 Over 300 neighbors of the Midtown Lake Street community gathered at the shared street parklet on East 29th Street and Bloomington Avenue for a block party and Eat for Equity dinner on Saturday, September 23. 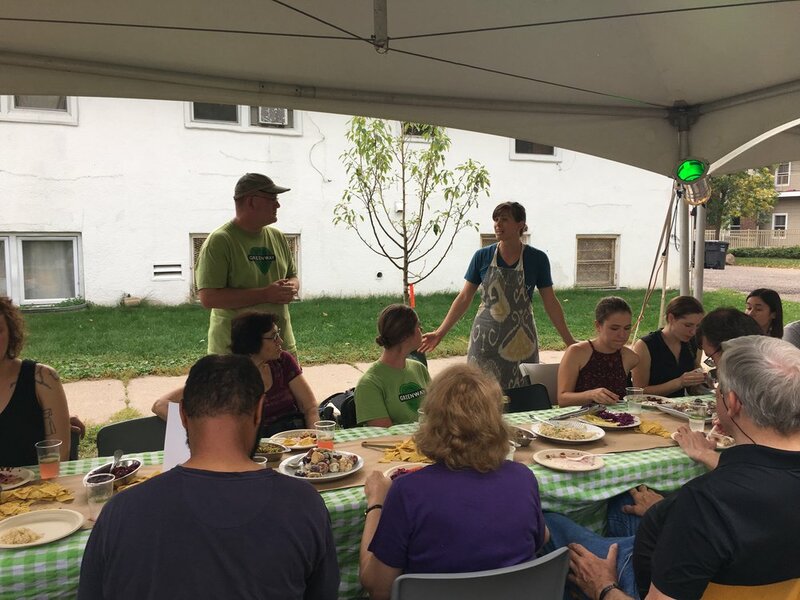 The block party was a culmination of the 29th Street Shared Street Demonstration, a project that has been underway since the spring. Midtown-Phillips neighbors have been involved throughout the planning and shared street elements installation process, and the block party offered an opportunity to come together and celebrate the shared progress. Loulou Sweet and Savory gave out free peanut butter and salted caramel Thai rolled ice cream courtesy of the Midtown Greenway Coalition while children and adults explored the different elements of the 29th Street Shared Street Demonstration. Community members helped plant native flower gardens near the bump-outs on East 29th Street and 17th Avenue, while kids and adults alike enjoyed playing table tennis, bags, chess, and basketball. Local artist Tim Blighton arrived at 8 a.m. with his daughter, creating sidewalk chalk art throughout the neighborhood. Residents created their own sidewalk art, adding butterflies and plants down the street. Others shared their vision for the space using a visual picture board tool created for previous community meetings. The picture boards offer countless options for features, events, and elements of a shared street. People put colored dots on the features that they liked, enabling the planning committee get feedback on what is wanted and needed in the area. The 29th Street Shared Street Demonstration will continue until October 15th. Community members can provide feedback on the demonstration by calling 311 or taking a short survey from the Midtown Greenway Coalition. If the Greenway Coalition receives positive feedback, they will work with the City of Minneapolis and elected officials to try to make the changes along the section of East 29th Street permanent, and extend these features to Cedar Avenue on one end and to the Midtown Global Market on the other. Jensen also highlighted one of the most community-driven elements of the project. Jensen’s announcement was met with applause, capping a great day on 29th Street.